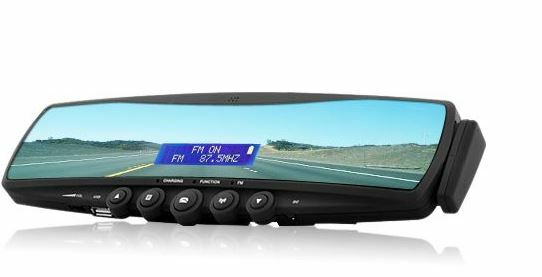 The bluetooth rear view car mirror is essentially three products in one. A Bluetooth headset which can pair with your phone to make it hands free, a digital display which can display who is calling without having to look at your phone and lastly a rear view mirror. My first impression of the device when I got it out the box was “it’s huge!”.. and believe me it is and also has a fair weight to it. My initial thought was that it may even pull my own car mirror off the windscreen. I tested using my Nokia E65 and decided to try and pair the devices together. So on went Bluetooth on the Nokia and from experience with Bluetooth headsets you have to put the headset into discovery mode. So in the box was the small 4 page manual and on reading it to find out how to put it in discovery mode I realised the instructions where for a different model; wowever the instructions looked similar so I continued. I paired the device with ease and the mirror displayed it’s first display to me and said ‘paired’. This actually then took me back a few years as the text display looks like a Sinclair calculator, very retro! It may be basic but it displays what’s needed. I was then presented with the word ‘connected’ and my Nokia displayed the headset symbol so all was well. A simple press of the main button on the ear piece and the mirror displays ‘voicedial’. You then just speak a name of someone in your address book and it then relays it to the phone, tries to match the name and then dial. Sounds simple and it was. I dialled several people via voicedial and was impressed with it’s accuracy. The mirror however did not display who I was calling so if you are driving you can only hope it has dialled the correct person. Incoming calls are where you would expect this device to offer some nice features. However, this is where it disappointed me a little. An incoming called whilst paired to my Nokia would display the person’s phone number and I could click the main control button and talk to them. A simple press of the main button ends the call. I could not get the device to read my contacts list and display the persons name. The manual says it will display the callerID so I can only assume that just means the number. There was one issue here. If someone calls you from a withheld number then the mirror displays nothing and you just have to either answer the phone or ignore it. On to fitting it in the car now. The mirror itself is quite solid and has some clever spring loaded plastic clips on the back so it easily fits over your current mirror but does take a bit of dexterity to remove it. That aside my first impression was right; it is huge! So huge infact that you can see yourself in it when aligned to the rear window. That in itself is very distracting. Also, my sun visors would not come down all the way and if you did forget about the mirror for a minute then you could easily knock it off position.